The sage-grouse is a beautiful species of bird that makes its home in the sagebrush sea of the North American West. It is the largest grouse in North America. Every spring male sage-grouse gather on a lek and perform an elaborate display to attract female sagle-grouse. They will strut, flap their wings against the white pouches and utter a distinctive series of gentle bubbling sounds. The grouse’s unique, dramatic, and impressive courtship dance is one of the most flamboyant mating displays in nature. This bizarre, yet spectacular display, easily captures the heart of people who are fortunate enough to witness it. For thousands of years, many Native Americans have had an intricate relationship with the sage grouse, and they still honor the birds today in their ceremonial dance. In many ways, the sage-grouse represents the unique and diverse habitat of the North American West. 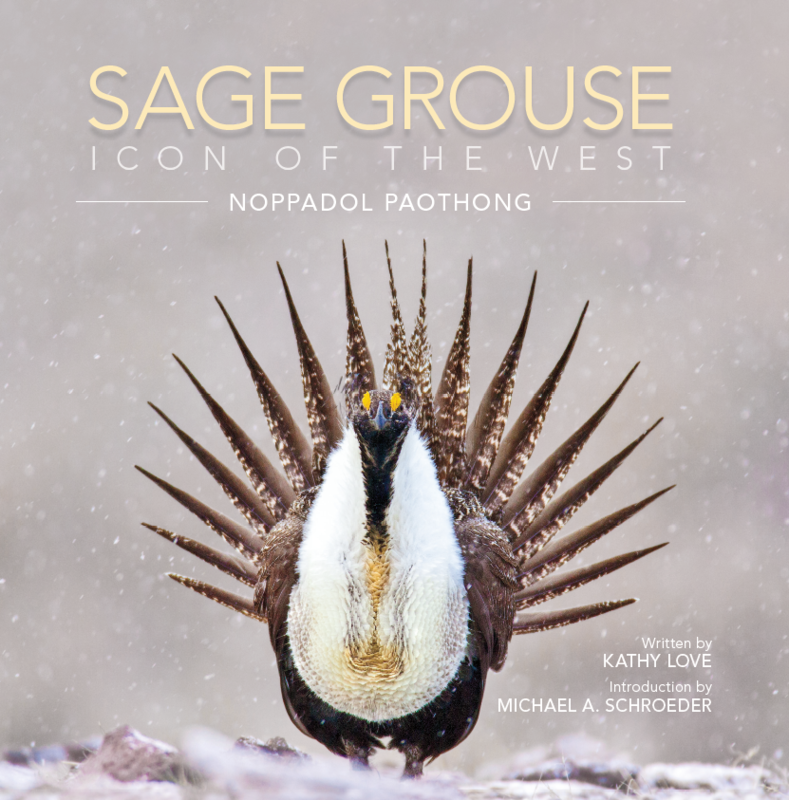 With up-close and captivating images that have never been documented before, the upcoming book, “Sage Grouse, Icon of the West” will introduce this unique and remarkable species and the land they depend upon. Every spring male sage-grouse gather on a lek and perform an elaborate display to attract female sage-grouse. They will strut, flap their wings against the white pouches and utter a distinctive series of gentle bubbling sounds. For thousands of years, many Native Americans have had an intricate relationship with the sage grouse, and they still honor the birds today in their ceremonial dance. Explorers and settlers in the 19th century frequently encountered them while exploring the West. To many, the high desert of the west, often referred to as the “Sagebrush Sea”, may seem empty and desolate. In reality it is home to diverse and abundant wildlife that rely on this unique ecosystem. The sage-grouse is one of the many species that make its home there and nowhere else. The sage-grouse once flourished in many states and several Canadian provinces; just a century ago, there was an estimated 16 million birds. Unfortunately, the population of sage-grouse has diminished drastically over the last few decades. Today, fewer than 400,000 sage-grouse remain, with a uncertain future. The healthy sagebrush habitat that the sage grouse relies on is becoming scarce. Millions of acres of sagebrush have been converted to agricultural and industrial uses, and the loss of this habitat and other threats have resulted in the rapid disappearance of sage grouse. After much debate and discussion, it was decided in 2015 not to list the sage-grouse as an endangered species but instead to embark on one of the largest conservation efforts in U.S. history. For these efforts to be successful, they must be made in ways that will benefit all – humans and wildlife that live in and near the sage-grouse habitat. With up-close and captivating images that have never been documented before, Sage Grouse: Icon of the West introduces this unique and remarkable species and the land they depend upon. It also hopes to deepen the discussion about conservation efforts for the sage-grouse so that our next generation, too, can marvel at their beauty and grace. Noppadol Paothong is an award-winning nature and conservation photographer. His focus has been on rare and endangered species, primarily on grassland grouse and their fragile habitat. He is a staff wildlife photographer with the Missouri Department of Conservation, and his images regularly appear in their publications, including Missouri Conservationist and Xplor. He has received prestigious national and international honors for his work, including “Best of the Best” at Outdoor Writers Association of America Photo Contest, Picture of the Year International, National Wildlife Photo Contest, Nature’s Best, Audubon Photo Contest, and Missouri Photojournalist of the Year. He recently published a book on North American grassland grouse, Save the Last Dance, A Story of North American Grassland Grouse, that beatifically captured the dance and displays of seven grouse species. It was well received by the public and highly praised by photographers and conservation experts around the country. It also won a gold medal in the Independent Publisher Book awards competition. Kathy Love won numerous awards for her reporting on people, wildlife, and the environment, including Chevron’s “Take Pride in America” award and honors from the Association for Conservation Information and the Outdoor Writers Association of America. She edited the “Missouri Conservationist” magazine for ten years, as well as books on wildflowers, butterflies and moths, reptiles and amphibians, and most recently, Save the Last Dance, a Story of North American Grassland Grouse. Dr. Michael Schroeder is a Certified Wildlife Biologist who has pursued research and management of grouse since 1981. He joined the Washington Department of Fish and Wildlife (WDFW) in 1992 and has continued to focus most of his activities on the biology and management of grouse. effects of farm programs on greater sage-grouse, sharp-tailed grouse, and other species of shrubsteppe wildlife. He has worked with graduate students from Washington State University, University of Idaho, and Eastern Washington University to address specific management issues related to grouse. To view experts’ testimonials, click HERE. To view sample pages, click HERE. To view intro video, trailer, and species profile videos, click HERE.